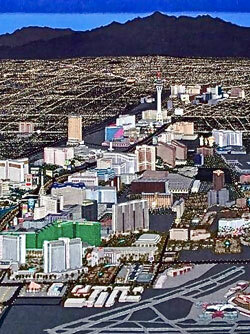 The Las Vegas Tapestry (2009), currently housed at the Trifecta Gallery in the downtown Vegas Arts Factory, is slow art. Perhaps it is the slowest of all art. Some radically posited but poorly understood quantum force seems to emanate from its 7′ X 11′ form. Not only did I stand still long enough to really look, I kept on looking, eventually noticing that my jaw was slack—a sure sign not only of a hearty feedback loop, but also of a kind of hunger. I wanted more. I wanted to stay. I wanted to keep looking. In a city that lives and dies by stimulation, a city where animated X-rated marquees vie with the real thing (as well as free-fall thrill rides, bloated jackpots, and gastronomic rapture, inter alia), the Las Vegas Tapestry holds its own. The sensual beauty of the piece, hand-woven by an enigmatic artist named “Sola,” presents a nighttime portrait of Vegas circa 2007, a moment when the city’s iconic mid-century architecture was imploding to make room for chic metallic towers, when vestiges of exotic Middle Eastern themes yielded to international corporate glam. Working from photos, drawings and observation, Sola unraveled thrift-store sweaters to loom a hyper-realistic tapestry in which The Stardust Casino eternally flashes its pinky-blue facade, and both Cher and Elton John are forever headlining at Caesar’s Palace. Rumor is that the 74-year-old artist counted each and every palm tree, positioned the exact number of windows in each building, weilded a measuring tape in the field. And yet, the architectural accuracy seems only a pretext for woolly expressionism. The Las Vegas Tapestry warp threads may be perfectly parallel, but the weft weave rises and sinks, wraps and disappears. Something is missing—the sun-burned tourists, the Hummer Limos, the planes at the airport, the helicopters in the sky. It took me a while, but I connected the purged cityscape to the stricture of its making. Tapestry requires a monastic dedication—a 10-hour day may produce less than a precious square inch. In this case, the piece took around 8000 hours to complete over three years. The woman who made it carries all her belongings in one suitcase, claims to have only one set of clothes, donates the proceeds from tapestry sales to charity, makes a living by knitting caps from the leftover yarn, and moves on to the next city when her work is through. Asceticism is literally woven into her depiction of a city that prides itself on iterations of fun-loving excess. Is then the Las Vegas Tapestry a kind of Buddhist meditation? Do the three compositional bands—the chaotic intensity of the Strip, the placid homogeneity of suburbia, and the dark sovereignty of the jagged mountains function as a spiritual allegory? And how could Sola have woven an artistic masterpiece worthy of MOMA or LACMA, the Pompidou or Bilbao, at a time when tapestries are routinely maligned as fiascos of ‘craft’? Or does the cutting-edge 2011 Venice Biennale, with its machine-made contemporary tapestry exhibition (a first), signal that society needs fabric, vegetable threads it can follow in a ragged world that appears to be unraveling at every seam? I’m not sure yet. It’s going to take time to slowly figure it out. This entry was posted in Art and tagged allegory, architecture, art, asceticism, Bilbao, Buddhism, Caesar's Palace, casino, Cher, culture, desert, Elton John, excess, gallery, Hummer Limos, LACMA, landscape, MOMA, photo, Pompidou, protrait, Sola, stimulation, Strip, tapestry, The Stardust Casino, threads, thrill rides, tourists, Trifecta, Venice Biennale. Bookmark the permalink.